Last summer I posted my storytime philosophy and since I recently found another version of the Hallmark ad, I thought I'd share it as well. If there was one message I'd like to give to parents, library administrators, budding librarians, etc. 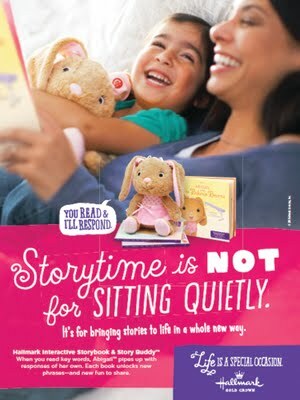 it would be this: storytime is not for making kids sit silently like robots. Storytime is for encouraging imagination and for introducing a love of literature. There are no grades and no tests*. Thank goodness! There will be plenty of those in the kids' futures. I'm honored to have the chance to play games, sing songs, tell jokes, chant rhymes, and read a few of my favorite stories to the kids in my town. It is a privilege to watch them grow up and move on. *I don't mean any disrespect to our friends in the school sector. I was inspired to become a librarian because I had an amazing school librarian. Mrs. G. died a few years ago and I am sad that I never told her how fond my memories of being in her elementary school media class are. I was lucky enough to attend a small public school where kindergarten through high school were in the same building, so I had the opportunity in high school to serve as her student aide. It wasn't glamorous work, shelving books and typing spine labels (on an actual typewriter! ), but it led me on the path to my current career and that has made all the difference in my life. This is all kinds of fun! And you're right! Storytime is all about having kids experience stories in a new way. Wiggling is part of storytime. If it's a good story, the listeners want to move in close so they don't miss anything!